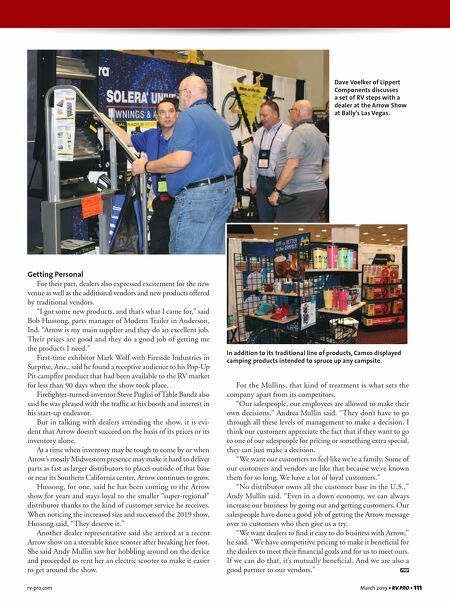 110 • RV PRO • March 2019 rv-pro.com Distributor Show Coverage A F T E R M A R K E T the entrance of the hall for customers to double-check their orders throughout the show. "It gives our customers the ability to go in and edit an order in a timely fashion," Andrea Mullin said. "They don't have to dig through a pile of papers like they did in years past." The kiosks also made it possible to email the orders to co-workers back at the home base to make sure nothing had been missed or forgotten or that the dealer had stayed within his budget. As recently as four years ago, the Arrow show relied on paper orders that had to be picked up from booths on a regular basis and manually entered into the system for processing. "Compared to the way we used to go with pen and paper, it also adds total transparency for the vendors," Andy Mullin said. "They know exactly what they've bought. They can compare it to where they were at noon last year. From our standpoint, we don't lose any orders." Another new feature of the show benefitting vendors was the addition of an Arrow Suite – a special room on a floor above the show for salespeople to take groups of customers for a few minutes to escape the hustle and bustle of the show and give a brief presentation. "That way the salespeople and managers could take cus- tomers up for a drink or to get away from the crowd," Andrea Mullin said. "It is really nice. If you have a salesperson with multiple customers, they can take them up to the suite and relax or have snacks and beverages. That's been very successful for us this year." 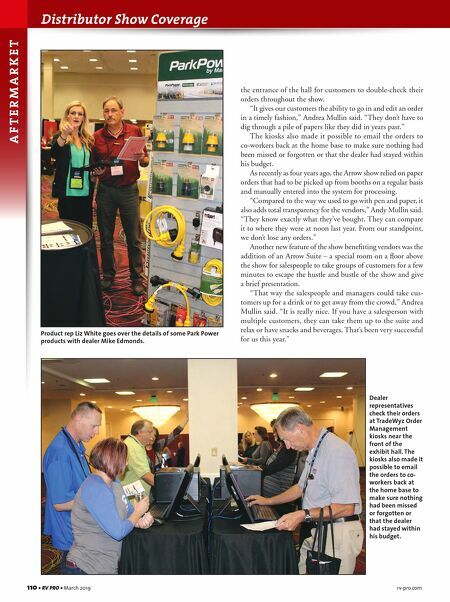 Product rep Liz White goes over the details of some Park Power products with dealer Mike Edmonds. Dealer representatives check their orders at TradeWyz Order Management kiosks near the front of the exhibit hall. The kiosks also made it possible to email the orders to co- workers back at the home base to make sure nothing had been missed or forgotten or that the dealer had stayed within his budget.